Since enrolling at Marian as a underperforming fifth grader, Alex has improved her grades and her confidence has increased. Moreover, she went from an overall composite at the 22nd percentile to the 52nd percentile on the IOWA Assessments during her time at Marian! Alex is particularly close with her art/media teacher, Sarah Paulsen-Fuller, who has watched her blossomed over the past four years. “When Alex first started art classes at Marian in the fifth grade, if she got stuck in a project she would just stop, instead of trying to figure out how to solve the problem. I often wrote on her report cards that I wanted her to ask me for help as she needed assistance in art. While she was enthusiastic about being in class, she had trouble with manual dexterity. “This school year (2016-2017), in addition to being in my art class, Alex was also in my Stop Motion Animation Media Club and Sculpture Art Club. During animation class, I worked with Alex and her partner Munta to build sets for their animation. We figured out how to build a car, a hospital, and a home Christmas scene using cardboard and found objects. I was encouraged to see Alex take the lead and direction on this project and finally began to see her emerge as a building problem solver. She also did a good job directing and keeping her partner on task to finish their film. 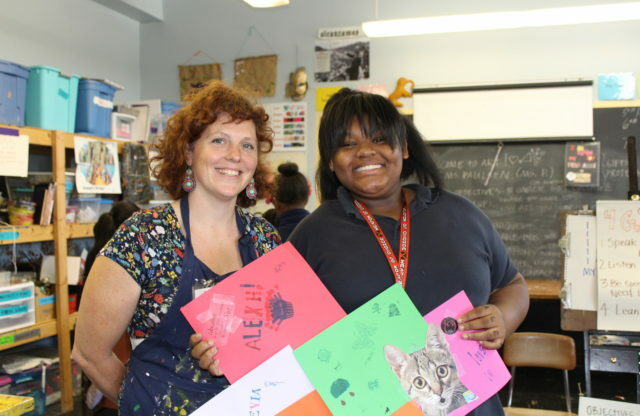 “During spring Art Club, students developed their own sculpture projects. Alex and her partner Vicky decided to build a house. From the beginning, Alex demonstrated pure enthusiasm. She and Vicky gathered materials for their house; starting floor by floor they built up the space. Every week Alex would make a new list for me of supplies she needed: balsa wood, foam, scrap wood. Vicky and Alex even began to bring supplies from their own home. Vicky went as far as to disassemble one of her old Barbie houses to source materials! I’d see the two of them in the hallways and they’d tell me how excited they were to work that day. Towards the end of the year, they started to ask if they could work on it during art class. They would finish their art class projects quickly, just so they could work on their house for Art Club. Prior to 2017, Alex had not participated in our Enrichment Program Showcases as a performer. However, I was proud to hear her confidently present her house at the showcase, with Vicky, and talk about the contents of each room.